This edition of choral works by Einojuhani Rautavaara follows on the great success of the releases of his twelve concertos and eight symphonies, in a collectors' box set. 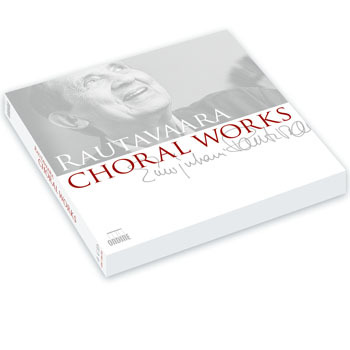 Featuring sacred as well as secular works, this release shows the diversity in terms of style, expression and content in the choral works Einojuhani Rautavaara has composed. They have brought him the status of the most significant living composer of choral music in Finland. Starting with first choral compositions in the 1950s, this is nowadays the most extensive category in his output. Rautavaara is since Sibelius perhaps the most internationally known living composer, with numeral international awards. These recordings were produced in collaboration with the composer between 1995 and 2002 and have been previously released to international popular and critical acclaim. They feature the two mostly acclaimed Finnish mixed choirs, the Finnish Radio Chamber Choir and the Finnish Philharmonic Chorus, as well as the Helsinki Philharmonic Orchestra and conductors Timo Nuoranne, Eric-Olof Söderström and Leif Segerstam. This compilation does not include the more recent Missa a capella, that will be released on a later recording in spring 2013.